Three Day Hangover gets all romantic with R+J: Star-Cross’d Death Match, their next Shakespeare drinking theatrical extravaganza performed in a bar with audience participation and booze. Lori Wolter Hudson directs a cast of ten, including Nick Mills* (The Unavoidable Disappearance of Tom Durnin, The Steadfast) as Romeo and Suzy Jane Hunt* (Broadway’s Dead Accounts, rogerandtom) as Juliet, with Matt Bradley*, Garrett Deagon, Grace Gealey*, David Hudson*, Paul Kite*, Jenna Panther*, Brendan Spieth*, and Titus Tompkins*. Six performances will be staged at Harley’s Smokeshack (Midtown), 356 West 44th Street, 2nd Floor, New York, NY 10036 on Wednesdays, Thursdays and Fridays at 8pm from September 25-October 4, 2013. *Member AEA. Appearing courtesy of Actors’ Equity Association. R+J: Star-Cross’d Death Match is a highly immersive production of ROMEO & JULIET that places the audience right in the middle of Shakespeare’s most famous family feud. When two households break from ancient grudge to new mutiny, spectators must pick a side in the fight! Young love clashes with quick tempers and there will be consequences for actors and audiences alike! Watch your back and fall in love in an evening of rivalry, romance and really awesome drink specials. Tickets are $10 and can be purchased online at http://threedayhangover.bpt.me/. A full cash bar (no drink minimum!) is available throughout the event. Special drink prices include $3 domestic bottles and $5 well drinks. There will be no food available during performances, but you can come early or stay after and eat at the restaurant downstairs. Lori Wolter Hudson (Director, Co-Producer) is a co-founder of Three Day Hangover. Recent directing credits include: Closing Costs (The Barrow Group), According to the Chorus (FAB Women), Tania in the Getaway Van (NHP), RSVP a radio musical (iTunes), And Miss Reardon Drinks a Little (NYU-Strasberg), Running and The Classroom (FringeNYC). She assistant directed the TONY Award-winning revival of Edward Albee’s Who’s Afraid of Virginia Woolf?, and Craig Lucas’s The Lying Lesson with director Pam MacKinnon. She is the artistic associate of The New Harmony Project and SDC associate member. Graduate of the University of Evansville. www.loriwhudson.com. Ben Charles (Adaptor) is an actor/writer currently based in NYC. Recently, in the city, he has worked with The Pearl Theatre Company, Amios, the New York Classical Theatre, and Hedgepig Ensemble Theatre and regionally with The Milwaukee Rep., Cleveland Playhouse, the Utah Shakespeare Festival, and the Texas Shakespeare Festival. He is a proud graduate of the Professional Theatre Training Program (PTTP). Ben is thrilled to be working on boozy Shakespeare with Three Day Hangover and this talented group of artists. 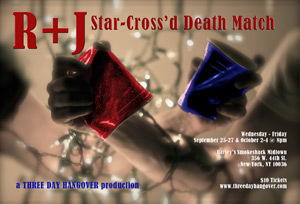 R+J: Star-Cross’d Death Match is presented by Three Day Hangover. Music by Phil Pickens & Titus Tompkins. Dramaturg: Jay Turton. Assistant Director: Olivia Songer. Three Day Hangover is a New York City theater company that produces fresh, unexpected, immersive, joyful productions of classic plays in bars. We tell great stories and celebrate some of the most beautiful language in the world. We meet our audiences on their turf. We want our audiences to have a beer and relax. Then we want them to lean forward and get swept up in the story in a way they’ve never seen before. Three Day Hangover’s inaugural production, The HAMLET Project: Summer in the City, enjoyed rave reviews, a completely sold out run and extension and, most importantly, some of the feistiest, most engaged and raucous audiences Midtown has ever seen!